The U.S. Navy has been working for years to make GPS more robust and resilient, but most fixes are aimed at preventing jamming or spoofing (transmission of fake signals) and bridging short-term outages. That means these solutions only work against electronic attacks on GPS satellites and infrastructure that can be corrected or reversed. But one potential U.S. adversary has been working to improve their capability to physically destroy that infrastructure, which would render resiliency efforts irrelevant. China tested anti-satellite missiles in 2007, 2013, 2015, and possibly as recently as this past July. If the United States’ GPS satellites were destroyed early in a clash with China it could erase not just some of the U.S. Navy’s most important military advantages, but also its ability to perform many basic operations at-sea. Much has been made of reports that the U.S. Naval Academy is once again teaching future officers celestial navigation, which determines position on earth by measuring of the relative position of astronomical bodies like planets and stars, to use in case GPS fails. 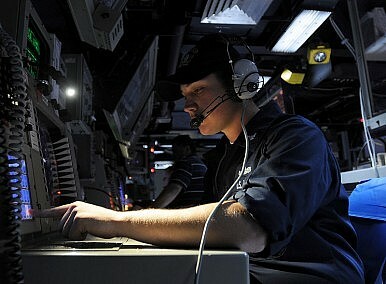 But the few hours of instruction they receive is inadequate preparation for actual warship operations use at-sea. Efforts are underway to develop advanced inertial navigation systems that are both miniaturized and do not require calibration (which generally requires GPS for reference) for much longer periods than existing systems. Automated celestial navigation systems that do not rely on human observations are also being explored by the Navy. Technologies like these may eventually provide true backups for providing positional information for Navy ships, but may not address another critical GPS service – timekeeping. Accurate navigation at-sea has long relied on time. Latitude, one’s position north or south, could be calculated with relatively straightforward celestial observations, but reliably determining longitude, one’s position east or west, had to wait for the development of clocks accurate enough to keep a time reference that could be compared to local celestial observations. GPS works by transmitting timing signals from its constellation of satellites that receivers then compare to determine position. Many systems that don’t need to determine location nevertheless depend on the time reference GPS provides. While one might think that it was cell phones that proliferated GPS, it was actually GPS that enabled reliable cellular networks in the first place by providing that global time reference, allowing networks to synchronize. Without GPS, calls wouldn’t connect and data would not transfer. Losing GPS would not just hobble navigation, but the global communications networks whose ubiquity is taken for granted. For the U.S. Navy, even if backup navigational systems could mitigate a loss of GPS, losing its time reference would still have far-reaching effects on its combat systems. In 2015 the Navy’s GPS program manager explained that attacks on GPS would impact the sensors, networks, and data links that enable the precision weapons that are the foundation of the United States’ military edge over competitors. The Navy’s plans to improve its future combat edge depend on proliferating ever more sensors and developing even denser networks of networks. Losing GPS, whether through electronic or physical attack, would not just leave the U.S. fleet less certain of where it is, but potentially hobbled from defending itself against attacks. Some of the worst consequences of GPS timing interruptions might be mitigated through advances in Chip Scale Atomic Clocks (CSAC). The atomic clocks at the U.S. Naval Observatory that provide reference time for the GPS constellation are the size of cabinets. The first commercial CSACs were smaller than a pack of gum and are getting smaller, offering the potential to be installed as timing-backups in devices that already rely on GPS signals. Still, CSACs and other mitigating technologies do not replace the physical destruction of the GPS or communications satellites U.S. warships depend on, they only provide bridges, generally for a limited time and over a limited area. But with most of those mitigating technologies still under development, if the U.S. GPS and communications satellites were attacked today, the biggest difference between the sextants and long-range High Frequency radios sailors would have to reach for today and the equipment their forebears were using to find their position and communicate in World War II is how little practice sailors today have operating with them. Proposals would reduce carrier fleet from 11 to 10 and invest in new capabilities.